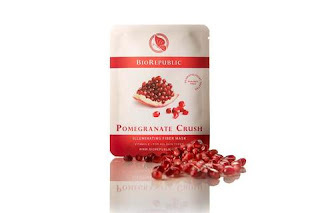 BioRepublic makes sheet masks for the face and eyes that are far superior to many cream and clay masks that you might use. The reason that they are superior is that with sheet masks you can concentrate the ingredients you want into a serum that is integrated onto the sheet and it is then wrapped up. It is then worn ton the face for around 20 minutes. The serum is then left to sink into the skin while if you had worn a clay mask or a cream mask, you would have washed it off. Having a serum sink into your skin is much more preferable than using a clay mask that washes off and does not leave any ingredients behind that sink into your skin. Clay masks usually only bring impurities to the surface. What is really nice is that the sheet mask is biodegradable. This mask has been formulated without parabens, sulfates, pthalates, and triclosan. It is 100% cruelty-free. Each mask contains 1/2 bottle of skin revitalizing serum. It has been dermatologist tested for safety. To use: open packet. Gently unfold mask and apply to clean skin. Wear the mask for 15-20 minutes. Remove mask and lightly tap excess product into skin . No need to rinse. Your skin will feel renewed and look illuminated and bright. It also comes in a set of three ($14.95) and a box of ten ($44.95). This mask for the eye area has been clinically designed as an under eye treatment that repairs lat night damage and impeded the signs of stress and aging. Each pack contains two pure biocellulose under eye patches that deliver a restorative infusion of peptides, hyauronic acid, squalene, rose water, and Vitamin E. These little beauties are great for all skin types. Each mask provides a muti-hydrating dose of hyaluronic acid that locks in moisture on and beneath the skin's surface. They deliver swift blow to wrinkles, bags and dark circles. Use anywhere, no need to rinse. These masks were voted Condé Nast Traveler Essentials for 2016. This biocellulose under eye mask is made from 100% pure biocellulose hydrogel material. Biocellulose hydrogels were initially created for their ability to absorb and lock in moisture. They have also been used in transdermal medical delivery systems, due to their ability to effectively deliver medicine through the skin. Now this technology has been taken and has been applied to skincare, creating an effective, luxurious treatment with no harsh preservatives or impurities They are formulated without.parabens, sulfates,pthalates, or triclosan. The masks are 100% cruelty-free. They contain no synthetic preservatives, fragrances, PEGs, Butylene Glycol, or Propylene Glycol. The eye masks contain a high percentage of active ingredients and are a professional grade product. They have been dermatologist tested. 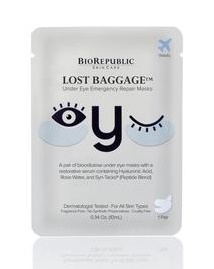 The eye masks also come in a pack of ten for $44.99. Both of these are available at www.biorepublic.com. Like BioRepublic on Facebook:https://www.facebook.com/BioRepublicSkinCare; Follow BioRepublic on Twitter:@BioRepublic_Co; Follow BioRepublic on Pinterest: https://www.pinterest.com/biorepublic/; Follow BioRepublic on Instagram:https://www.instagram.com/biorepublic/; Follow BioRepublion Google+:https://plus.google.com/+BiorepublicSkincare and Subscribe to BioRepublic on YouTube:https://www.youtube.com/user/BioRepublicSkinCare.